We are world-class innovators, working at the cutting edge of emerging technological capabilities to design and build new interactions and experiences. 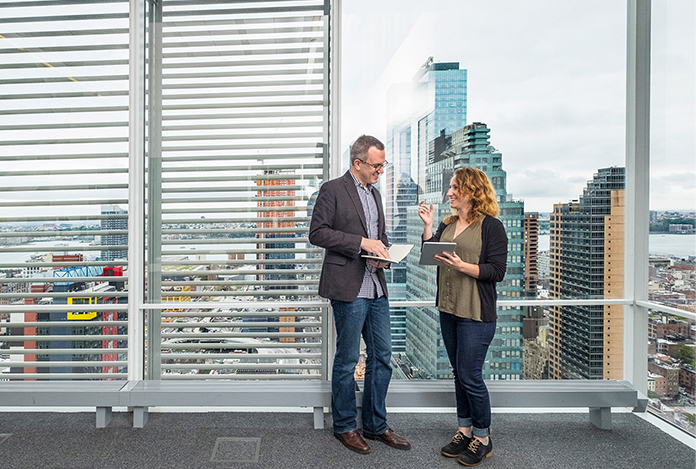 Together, we have co-led The New York Times R&D Lab, guiding the lab to international renown for creating experiences and ideas that shape the future of media. We developed a multi-faceted research agenda to explore technological and social changes that will impact the media landscape, led a team of creative technologists in designing and building new kinds of interactive experiences, and collaborated across the organization to influence strategic decision-making. Both of us have written and spoken extensively about our work, in publications and at conferences across multiple disciplines, including design, technology, media, and corporate innovation. We are adept at working across disciplines, and our approach combines user experience design, technical experimentation, and product strategy in an integrated, holistic way that is essential to any modern organization. Alexis is an award-winning creative director, user experience designer, and researcher whose work focuses on exploring the newly available possibilities of emerging technologies. She designs and creates compelling experiences that demonstrate innovative ways of engaging with information and with the world around us, including interactions with connected objects, data visualizations, and screen-based interfaces. She is also an accomplished writer and public speaker who can convene thoughtful conversations amongst diverse groups about the future of design, technology, and user experience. Her work has been covered and presented internationally in major publications, at prominent conferences, and in galleries and museums. Most recently, Alexis has been the Creative Director for The New York Times R&D Lab, where she was previously a Creative Technologist. In addition to her work at The New York Times, she has designed award-winning projects for clients such as FOX, Columbia University, American Express, The New York Historical Society, PBS, and others. Her media art and design work has been shown internationally, in such venues as the Cooper-Hewitt National Design Museum, SIGGRAPH, and the Chelsea Art Museum. Alexis holds an MFA in Design and Technology from Parsons School of Design. Matt is an executive, futures researcher, and team leader with deep experience in all facets of media technology, product development, cross-departmental workflow, and organizational change. His insights have transformed how companies produce products, serve customers and tell stories. A clear communicator, he is equally comfortable debugging code alongside developers as he is addressing international symposia. The work he's led has won recognition worldwide, and he is a sought-after speaker, consultant, and contributor. As its Executive Director, Matt co-led The New York Times Ramp;D Lab with Alexis Lloyd. During this time the Lab was featured in Wired, Make Magazine, Gizmodo, and the Columbia Journalism Review, and won a Silver Medal for Innovation Program from the Corporate Entrepreneur Awards. Prior to his stint at The Times, Matt was a Senior Manager at Accenture, where he created solutions for clients like PBS, Verizon, Discovery Communications, The Washington Post, The Associated Press, and EMI Music. He co-authored a patent for a social-media-based advertising program, and wrote several other pending applications. He received a BA in Computer Science from Boston University, and in 2010 was named a Distinguished Alumnus.